You are a gifted, creative writer and your first book is clearly the product of hard work, a wonderful imagination and exceptional research, allowing you to understand key historical characters and events that took place in ancient Egypt. You have also painted your characters so well that they easily come alive off the pages and your readers, including myself, can’t wait to learn what they will do next. The idea of using historic time travel and explaining how it is accomplished is a perfect concept, because almost all book readers and travelers have wished to go back in time and become a part of the segments of history that hold our passions. I can’t tell you how many times I have dreamed of being a spectator as they built the pyramids at Giza, watched an ancient Mayan ballgame or scrambled up the steep trail to the Machu Picchu with Hiram Bingham. And now you have made those dreams seem almost possible, and your explanation of how they accomplished their time travel adventures was simple and believable to me. As a writer myself, I am very proud of you and just a little jealous of your accomplishment as author of a fascinating and very readable book. The best of all compliments I can pay you is that your have written a book that is truly hard to put down. The real Payne Johnson is not a true professor, although he was a guest lecturer at The University of California at San Diego, and San Diego State University. Payne grew up in a newspaper family, as his Grandfather established the first newspaper in the Louisiana Purchase region in 1888, and his mother was a reporter on the Los Angeles Times for many years. In his business career, Payne was a marketing and public relations executive for International Harvester Company, traveling to more than fifty countries on business, where he developed his passion for early civilizations. He was also founder, editor and publisher of one of today’s successful regional magazines, “San Diego Home & Garden.” He is a productive free-lance photojournalist whose work and photos have appeared in numerous international newspapers and magazines and is now contributing his writing and photos to a new web only wine publication at winetalesmagazine.com. Payne is proud of the fact that he was elected a ‘Fellow’ in the New York based International Explorers Club. In 1989 he established his own tour company and continues today to lead groups on archaeological and historical tours to more than a dozen countries. 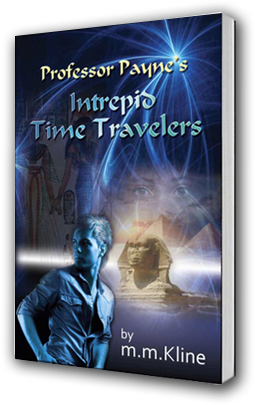 It was Payne himself who gave Marcy Kline her inspiration and title for “Professor Payne’s Intrepid Time Travelers,” when she was a participant on his extensive tour up the Nile River, through ancient Egypt, the Sudan and Jordan.